Back in podcast 269 community member Chase Ryan asked about a suitable PCIe expansion chassis to with one slot to take an HDX card, which needs Aux power. We looked into it and found that none of the existing single slot expansion chassis supported aux power. 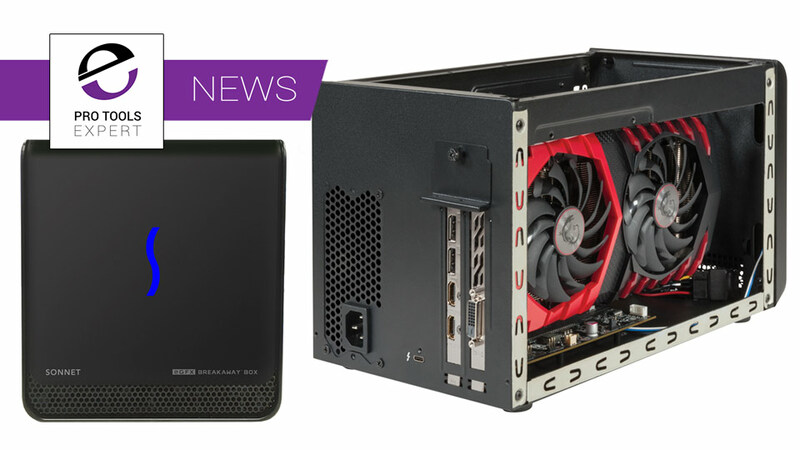 Well it might be wishful thinking that Sonnet heard our podcast and did something about it but they have just announced the eGFX Breakaway™ Box, a Thunderbolt™ 3-to-PCI Express®(PCIe®) expansion chassis with a single slot for connecting any size Thunderbolt-compatible PCIe card, including high-performance graphics (GPU) cards to a Thunderbolt 3-equipped computer. We designed the eGFX Breakaway Box with mainstream PC gamers in mind — especially those who want to enable gaming on small, light, and easy-to-carry laptops. Our goal is to provide the quietest GPU card enclosure that is both affordable and supports the most popular graphics cards. 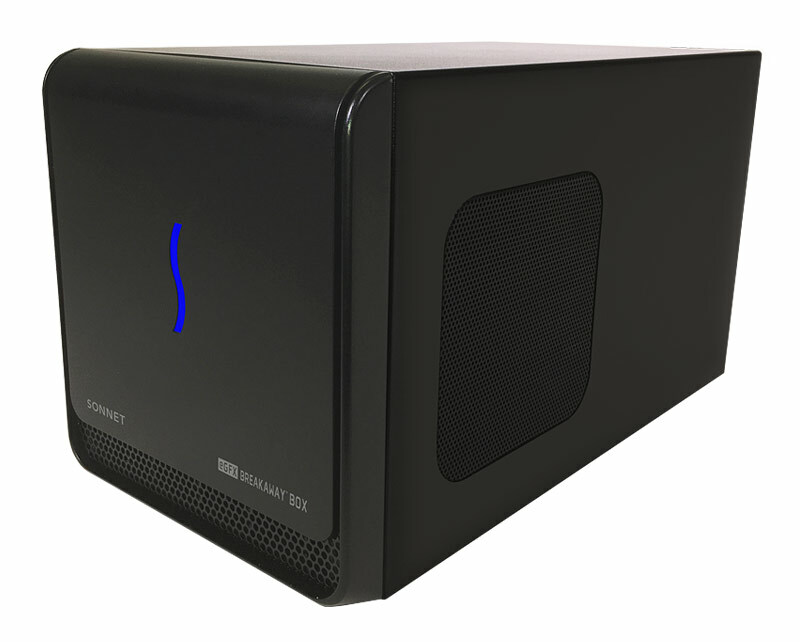 Additionally, the eGFX Breakaway Box is Thunderbolt-certified for both Mac and Windows, enabling customers with PCIe cards such as the RED ROCKET-X and Avid Pro Tools | HDX to benefit from using this enclosure with their Macs. And there you have it Chase, a single slot Thunderbolt 3 to PCIe expansion chassis with aux power designed in mind for the Avid HDX card. Sonnet will offer two eGFX Breakaway Box models, the eGFX Breakaway Box 350 and eGFX Breakaway Box 550, enabling the user to select the one best suited to his or her needs. The eGFX Breakaway Box 350 includes one 8-pin and one 6-pin auxiliary power connector, supports cards requiring 300W or less of power, and provides 15W of upstream power. The eGFX Breakaway Box 550 includes dual 8-pin auxiliary power connectors, supports cards requiring 375W+ of power, and provides 87W of upstream power, useful for charging a notebook computer. Each eGFX Breakaway Box model is equipped with a 40Gbps Thunderbolt 3 port that enables data transfers up to 2,750 MB/s, and supports popular GPU cards such as AMD Radeon™ R and RX series, and the NVIDIA GeForce® GTX 9 and 10 series. Sonnet claim that the Breakaway Box is the quietest eGFX box on the market and works with any Thunderbolt 3-compatible PCIe card regardless of length. If their existing units are anything to go by they are very quiet so here is hoping that claim is good. eGFX Breakaway Box 350 is expected to be available in early July 2017 with an MSRP of $299. eGFX Breakaway Box 550 is expected to be available late in the third quarter of 2017 with an MSRP of $349More information on the products is available.